Wash and drain pork chop (about 1 kg). Marinate with 50g Homei Spices Bake Mix for 30 minutes. Then it is ready for fry, stir-fry or deep-fry. (Also suitable for marinating chicken wings and beef). Allergy Advice: May contain traces of soya bean products. Ingredients: Corn Starch, Lemongrass Powder, Chicken Meat Powder, Pepper Powder, Salt, Sugar, Flavour Enhancer (E621), Anti-caking Agent (E551), Antioxidant (E320). 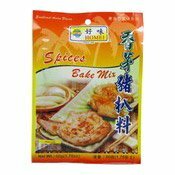 Simply enter your details below and we will send you an e-mail when “Spices Bake Mix (好味香茅豬扒料)” is back in stock!